disabilities, there are also many resources available to help you overcome those barriers and succeed. Below are some of the resources available to students and families. 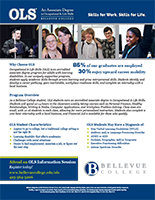 If you are an organization interested in being included on our Resources Page, or it you know of any additional resources not listed, please contact us at ols@bellevuecollege.edu with the information.